People in an unusual Harvard research project acted and felt twenty years younger. Dr Jill explains that though our bodies start to age at 30… there’s a natural way to slow your aging process –HgH. Numerous studies have shown that famous philosophers, inventors, and artists use the right and left brain hemispheres in unison. You can boost your own hemispheric balance using the *Quick Balance* MP3 that comes as a free gift with this brainwave training collection. This 5 minute audio is a powerful but playful audio with engineered musical sounds that strengthen your the corpus collosum to improve communication from one side of your brain to the other. Are you interested in avoiding unnecessary aging? Researchers say a major secret of healthy longevity is our ability to produce human growth hormone (HgH.) This hormone is naturally produced by your brain when you are young, but tapers off as you pass age 30. This reduction contributes to skin aging, weakened bones, less reliable intimate performance, and a far less reliable immune system. You can use the *Stop the Clock* MP3 in this collection to encourage your brain to produce more HgH. This 23 minute audio is a very pleasant but deeply powerful session focused on 1.05 cps Delta. This stimulates your brain to release natural Human Growth Hormone (HgH) to encourage stronger joints and bones, better skin, more energy, and less risk for certain diseases. You can use the *Senior Balance* MP3 in this collection to greatly enhance your mental functions and fight back against mental aging diseases. This 21 minute audio encourages hemispheric balance and builds mental focus. It is especially beneficial if you are over the 35 years old, or stressed. You need to fight back against aging. A study by Vincent Giampapa, MD, former president of the American Board of Anti-Aging Medicine, revealed that a certain combination of brainwaves dramatically affects production of three hormones important to increased longevity and well-being: Cortisol, DHEA, and melatonin. 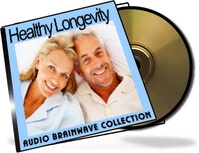 You can use the *Brain Brightener* MP3 in this collection to fight back against aging. This 10 minute brain sharpening audio is great for all ages, and is especially remarkable for those under high stress. The session ramps from zero Delta up to 40 cps Gamma and back down to zero Delta. This combination of brainwaves decreases the production of cortisol – the age accelerating hormone in the brain – but encourages the production of DHEA and your resistance to disease. It also builds your production of melatonin to help you fight physical aging. Please note: if you’re buying with your mobile phone do not use PayPal because it will not process. Use the 2Checkout instead!